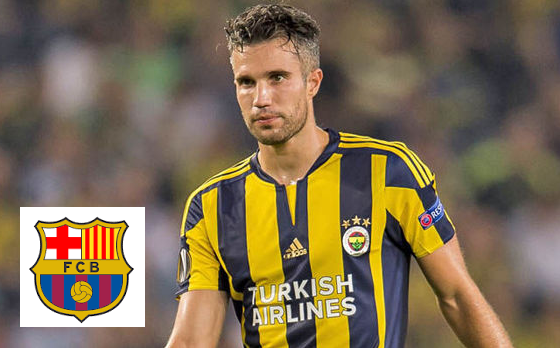 Robin van Persie reportedly eyes to switch Spanish Club FC Barcelona. Barcelona are also interested to sign the Dutchman Robin Van for £2.15 million transfer clause. It is learn to the source that the Fenerbahce striker wanted to leave the Turkish club and desperate to join La Liga Club as their fourth forward. On the other hand Barca eager to borrow him as an experienced backup for the trice strength Luis Suarez, Neymar and Lionel Messi. They wanted to use him as the replacement of those three due to their unwanted absence. As we see in last season Injuries of Argentine Messi and Brazilian Rafinha have almost destroyed Barcelona’s form and the absence of those striker the attacking line consider as so weak. Barca does not want to face the risk once again and it is the main cause why they so desperate to sign the Dutchman as their backup forward. The 32 years striker have scored of 22 in all competition in last season and goal 16 in Super League. He is a very talented Dutch professional who joined Arsenal in 2004 for £2.75 million. It was a long term deal which has been finished in 2012 when he joined at Man Utd for £22.5 million. He spent quite good season with The Red Devils till 2015. In 2015 he signed a three year contract with Turkish Super Lig side Fenerbahçe and led a fantastic year with the club. After a year the striker wanted to shift his boat at La Liga giant Barcelona. Barca already brought Spanish forward Munir El Haddadi as the back up for their three front Luis Suarez, Lionel Messi and Neymar. And now the club badly needed a well experienced striker to backup the front line up and Persie is the perfect choice to cover the lack of the three legent. And the most important anticipated matter is that with Van Persie the club would have not to face any big problem as the forward available on £2.15 million, which is too little clause for recent time. And Barca expected to be benefited by including him their squad. As the both parties showed the positive sign for the transfer, it is hoped that the switch will be taken place as soon. Fenerbahce has not shown any objection about the clause and it refers that they might agreed to complete the deal with Barcelona. So guys let’s see what happen and linked with us to get update.